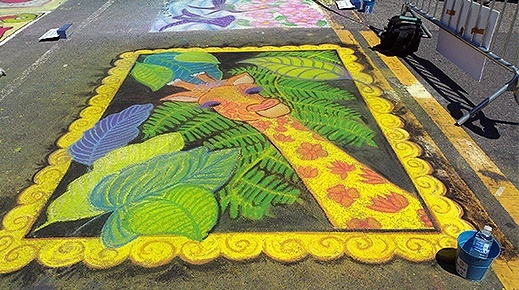 On Sunday, May 15th, the (unofficial) HUECU Chalk Artists gathered for a second year in a row to volunteer their artistic abilities for Cambridge Rotary Club’s Annual Spring Fundraiser: Chalk on the Walk at The Harvard Square MayFair. The day was blustery but sunny and chalk was flying as the artists tackled HUECU’s 7’ x 9’ square until final judging commenced at 3pm. This year's Chalk on raised over $30,000 for scholarships, assistance to homeless children at Christmas time, clean water project, dictionary project, polio vaccinations world-wide and ending hunger and homelessness! For complete photos of Cambridge Rotary Club’s 2016 Chalk on the Walk please click here. The final product below was designed by Le Huongh and Danielle White.